Published: Sunday, April 17th 2016. To show off our new rendering engine, introduced on April 12th, we created screenshots of all the Alexa top 500 websites. This is a list of the most used and visited websites around the world and thumbnail.ws will use it to showcase the quality of our API. 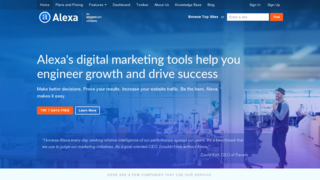 On the Alexa Top 500 page you can find 360 width screenshots (JPEG format) of the websites and if you click on a screenshot you will see the full sized 1280x720 PNG image.